Once you have an order in the system you can send it off to the supplier. Orders can be printed to be sent any way you wish, or they can be emailed. Start off by going to the Product orders screen and then follow these steps. 1. 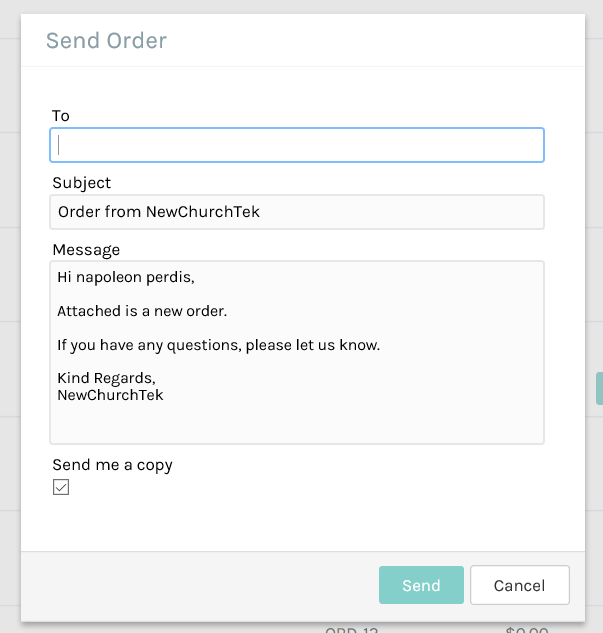 Click the Send option next to the newly created order. 2. Choose the option on how you wish to send the order. Normally it is easiest to email the order directly to the supplier, most of them will allow this. 3. Fill out the details of the email you wish to send to the supplier. The actual order document will be attached to the email that is sent. The order will now have it's status changed to Sent in the Product Orders screen. 4. You can Cancel an order or Resend it if required. Or once you have the order from the supplier you can receive the order.